As I was sipping coffee this morning, gathering my strength to face the day, three healthy deer walked past our window, just outside the fence line of our garden. I figure that as long as they are outside the fence, I'm okay with them. When they get inside the fence, then I have to deal with them. Anyway, between the deer and the time of year and the fact that everyone is thinking about gardening, I thought I would post this little ditty about gardeners battling deer. I did this poster for Heart-Springs Design, a wonderful landscape design firm that I have worked with for the last 20 years. My wife has worked for them for about the last 5 years. A very creative and talented group. Anyway, the owner of Heart-Springs gives a lot of seminars, and one of the topics was, "How to make a deer-proof garden". So, she needed some artwork for the class, and Voila!! It is always a challenge to make deer look evil, but I think the grimace worked pretty well. And with each character wearing boxing gloves, they are on a level playing field, in that neither one has the advantage. I think that is pretty reflective with the reality of gardens here in deer-country. 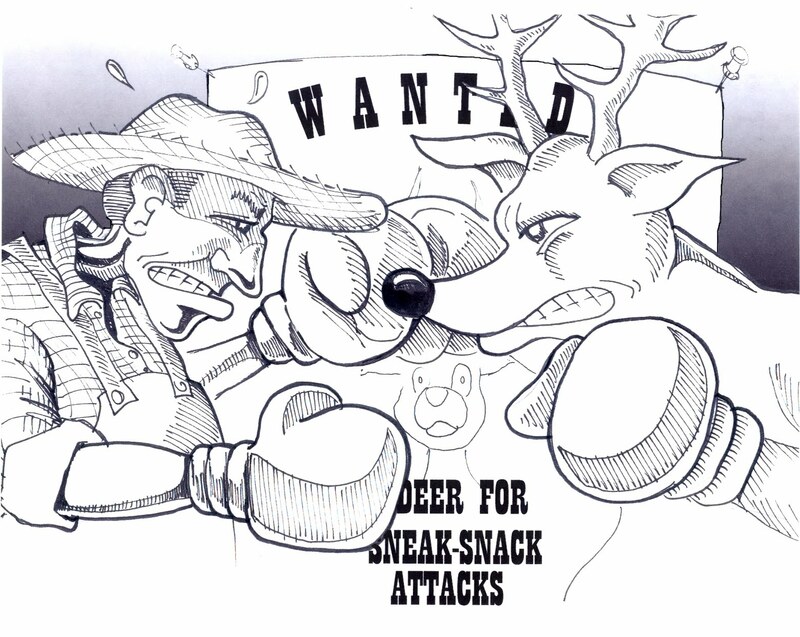 It certainly seems like we are always battling the deer without gaining the upper hand.